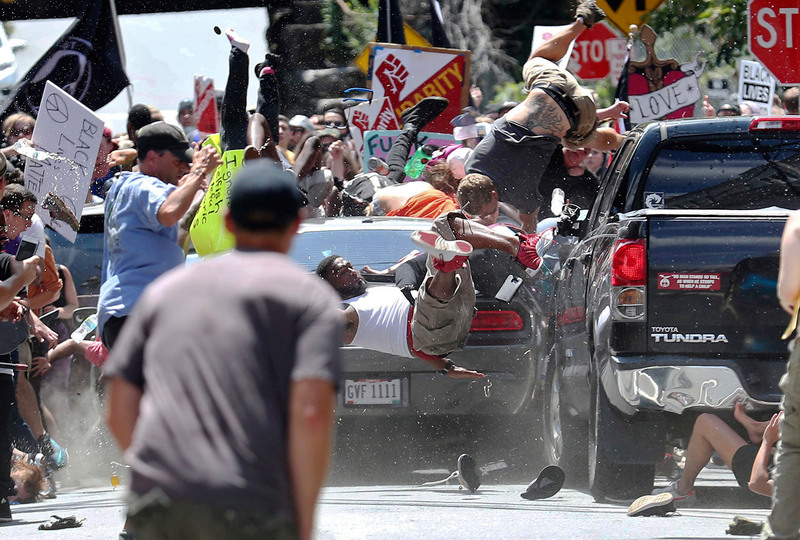 People fly into the air as a vehicle drives into a group of protesters demonstrating against a white nationalist rally in Charlottesville, Va., Saturday. 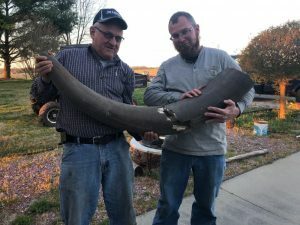 The nationalists were holding the rally to protest plans by the city of Charlottesville to remove a statue of Confederate Gen. Robert E. Lee. There were several hundred protesters marching in a long line when the car drove into a group of them. 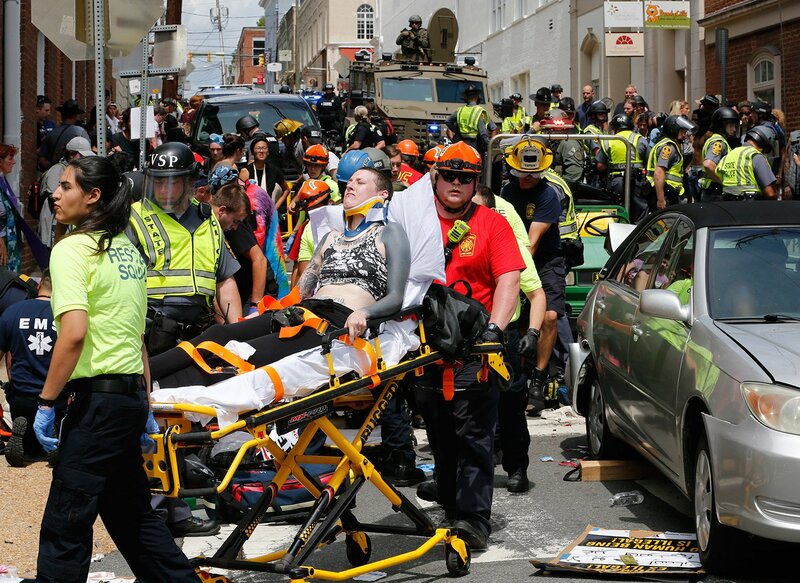 Rescue personnel help injured people after a car ran into a large group of protesters after an white nationalist rally in Charlottesville, Va.
People run to get out of the way as a vehicle drives into a group of protesters Saturday in Charlottesville. 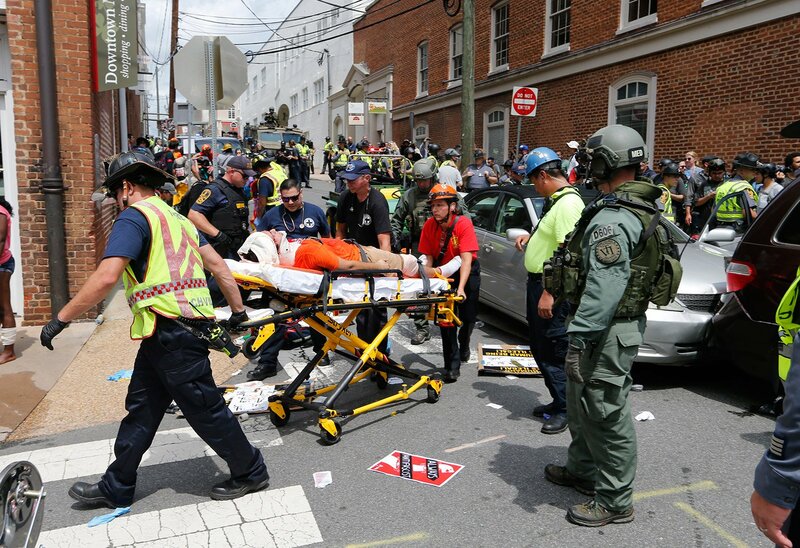 Rescue personnel help injured people after a car ran into a large group of protesters in Charlottesville, Va. One person was killed and at least 26 injured. 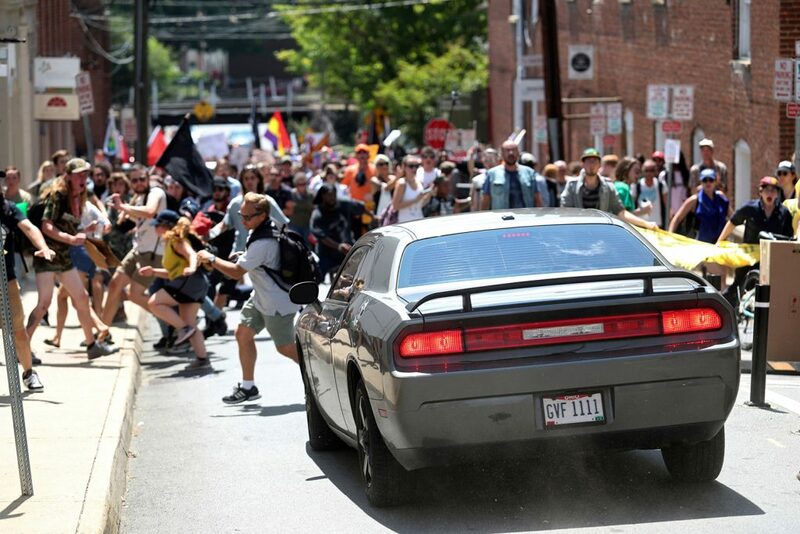 A vehicle reverses after driving into a group of protesters demonstrating against a white nationalist rally in Charlottesville, Va. The driver was later arrested. 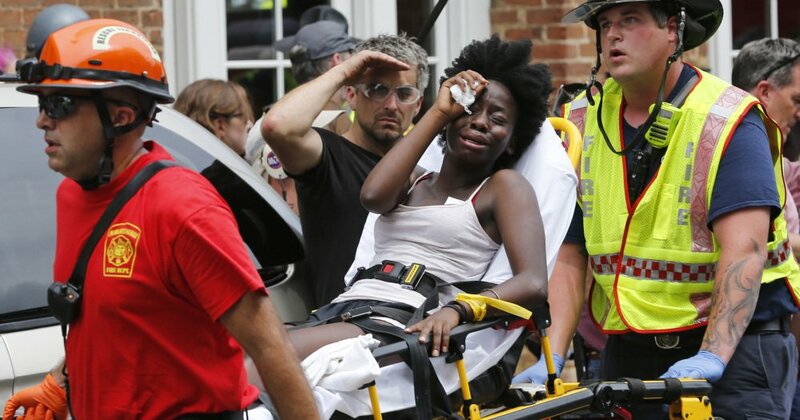 Rescue personnel help an injured woman after a car ran into a large group of protesters after an white nationalist rally in Charlottesville, Va., Saturday, Aug. 12, 2017. 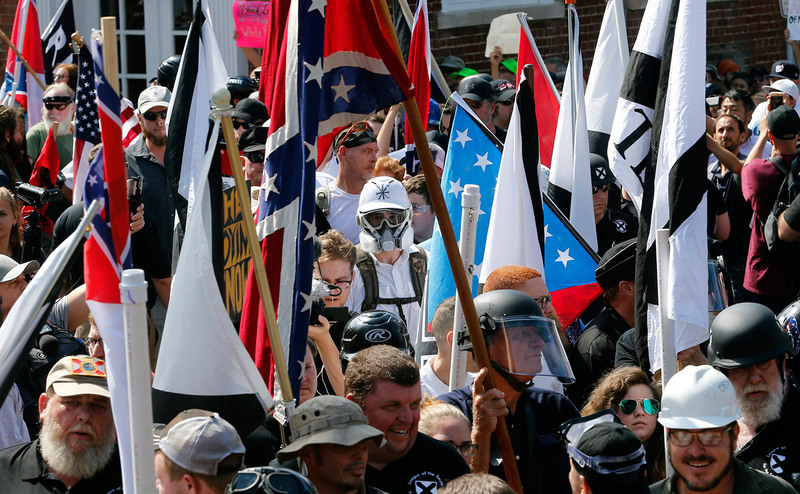 The nationalists were holding the rally to protest plans by the city of Charlottesville to remove a statue of Confederate Gen. Robert E. Lee. There were several hundred protesters marching in a long line when the car drove into a group of them. 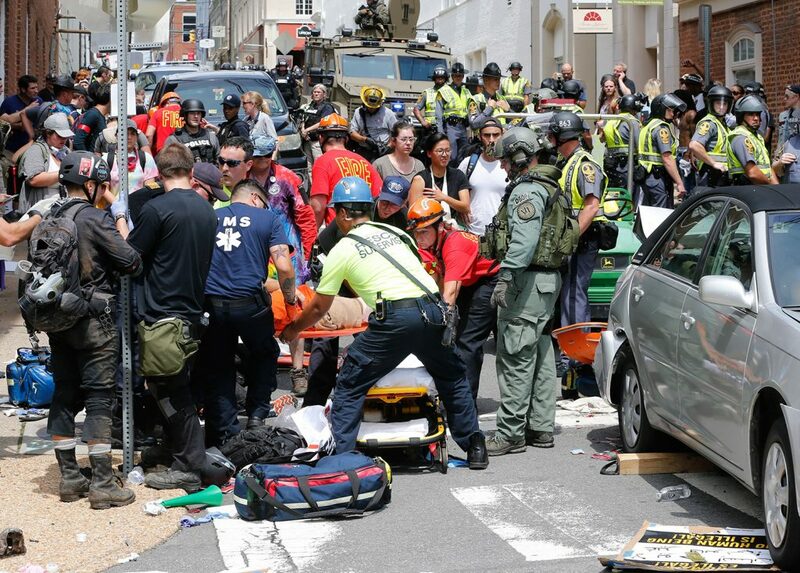 Rescue personnel help injured people after a car ran into a large group of protesters after a white nationalist rally in Charlottesville, Va.  The nationalists were holding the rally to protest plans by the city of Charlottesville to remove a statue of Confederate Gen. Robert E. Lee. There were several hundred protesters marching in a long line when the car drove into a group of them. 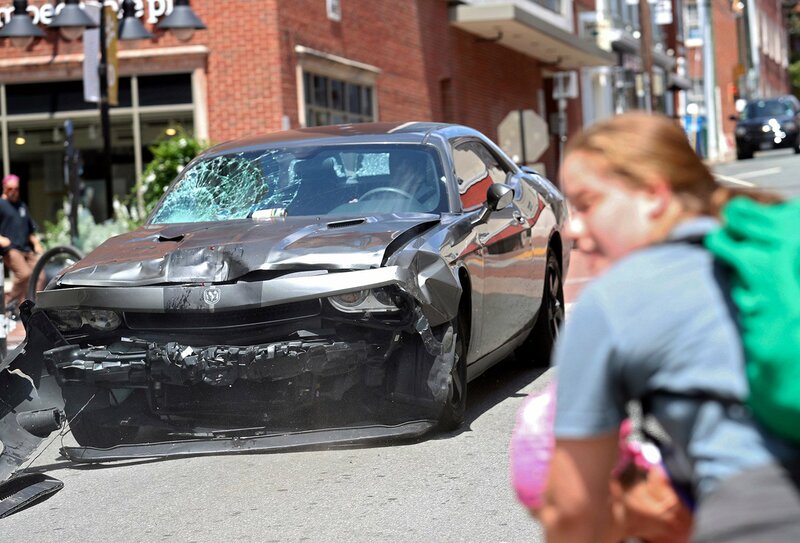 One person was killed and at least 26 injured during the violence in Charlottesville that ended with a vehicle driving into a crowd. 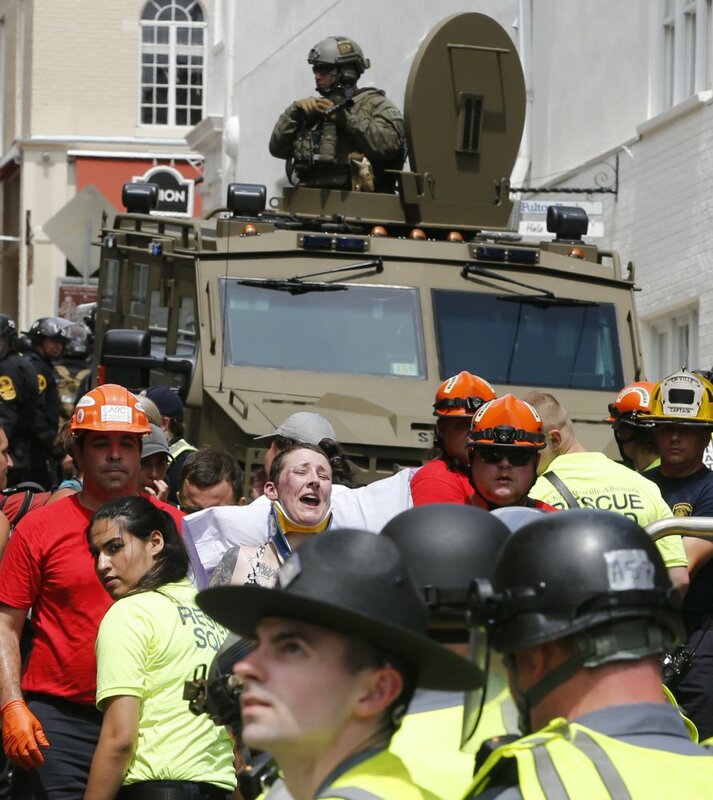 Rescue personnel help injured people after a car ran into a large group of protesters after an white nationalist rally in Charlottesville, Va., Saturday, Aug. 12, 2017. 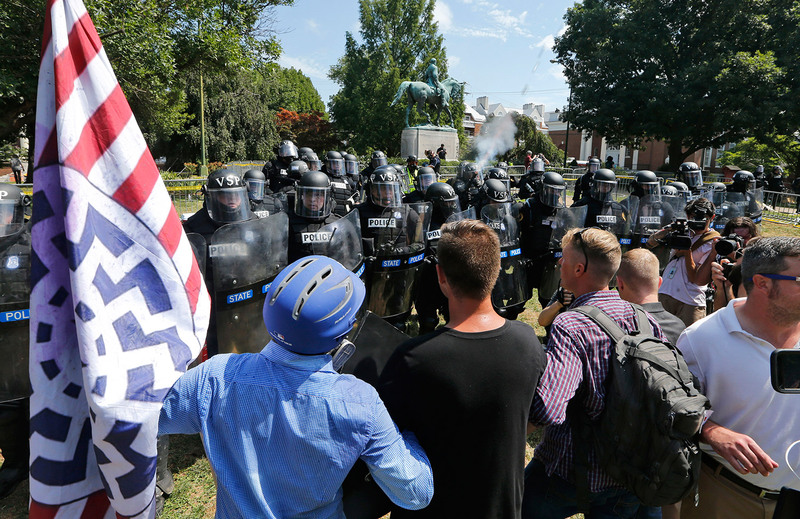 White nationalist demonstrators hold their ground against Virginia State Police as police fire tear gas rounds in Lee Park in Charlottesville. 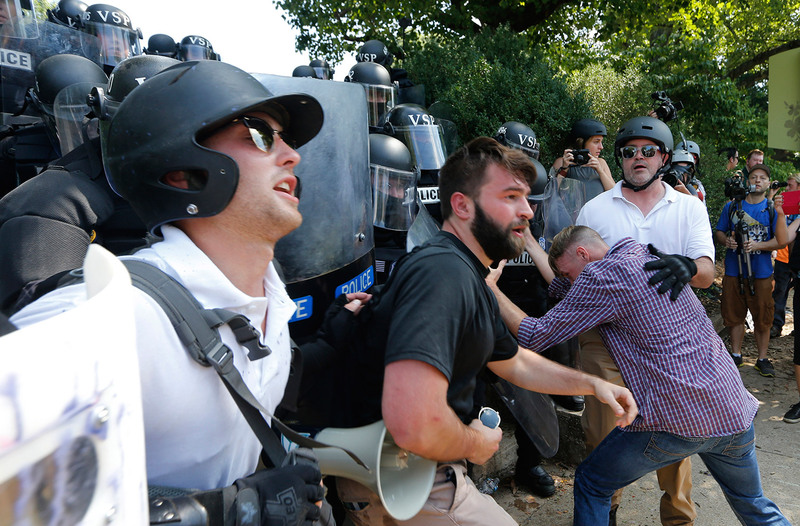 White nationalist demonstrators clash with police at the entrance to Lee Park in Charlottesville, Va. Later Saturday a car drove into the crowd, killing one person and injuring 19 others. 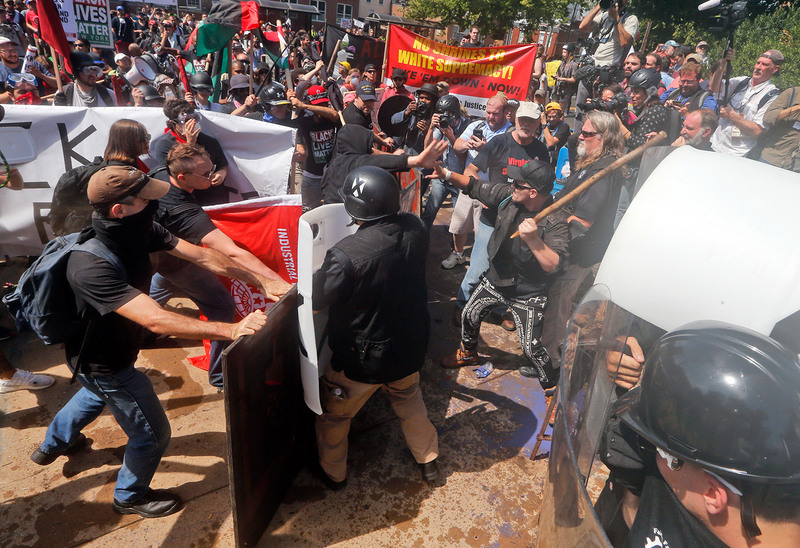 White nationalist demonstrators clash with counter demonstrators at the entrance to Lee Park in Charlottesville, Va., Saturday. Gov. 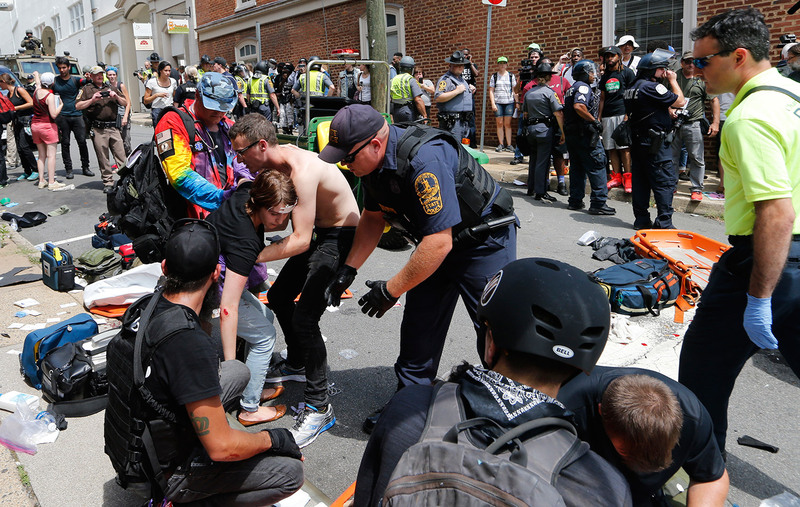 Terry McAuliffe declared a state of emergency and police dressed in riot gear ordered people to disperse after chaotic violent clashes between white nationalists and counter protestors. 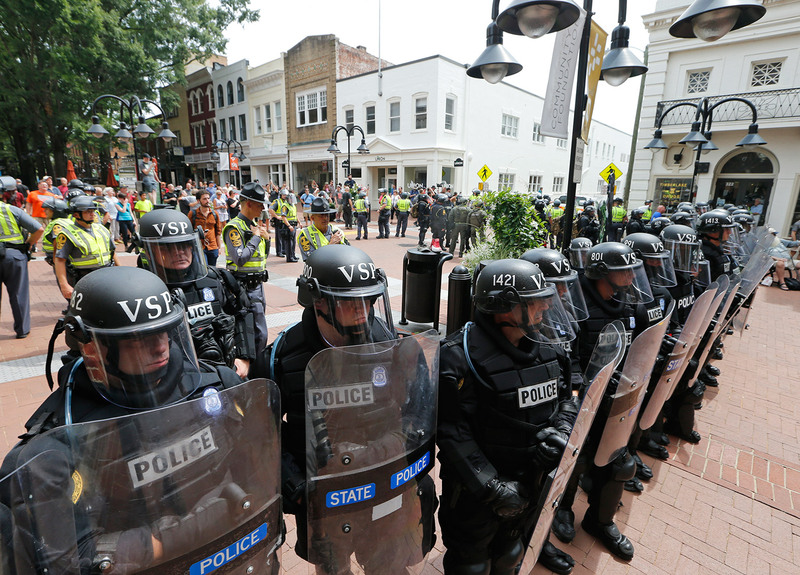 Virginia State Police cordon off an area around the site where a car ran into a group of protesters after a white nationalist rally in Charlottesville. 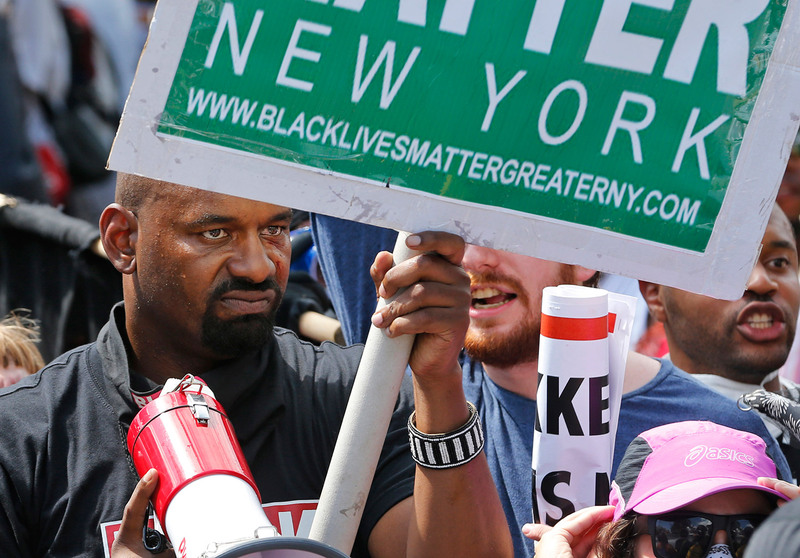 A Black Lives Matter New York demonstrator holds a sign to counter white nationalist demonstrators at the entrance to Lee Park in Charlottesville. 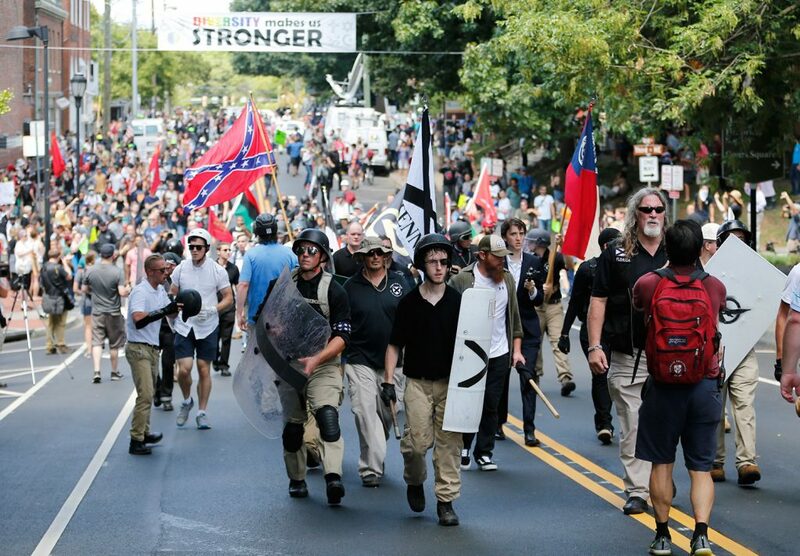 White nationalist demonstrators walk into the entrance of Lee Park surrounded by counter demonstrators. 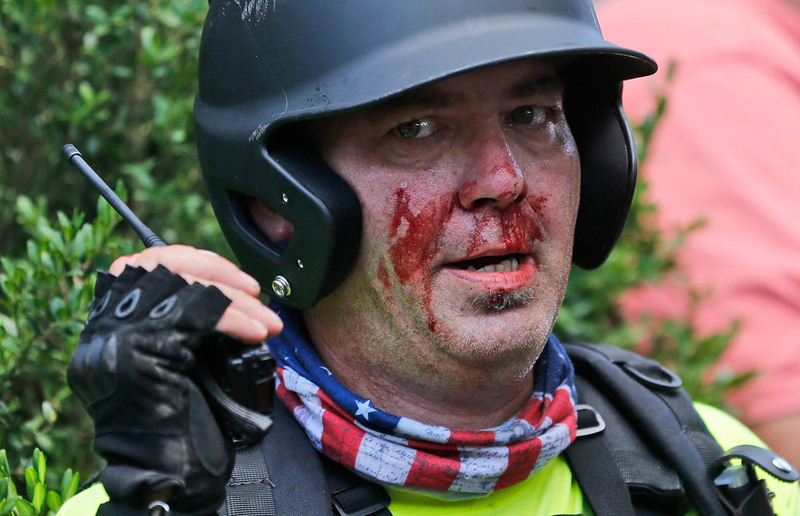 A white nationalist demonstrator, bloodied after a clash with a counter demonstrator, talks on the radio receiver at the entrance to Lee Park. 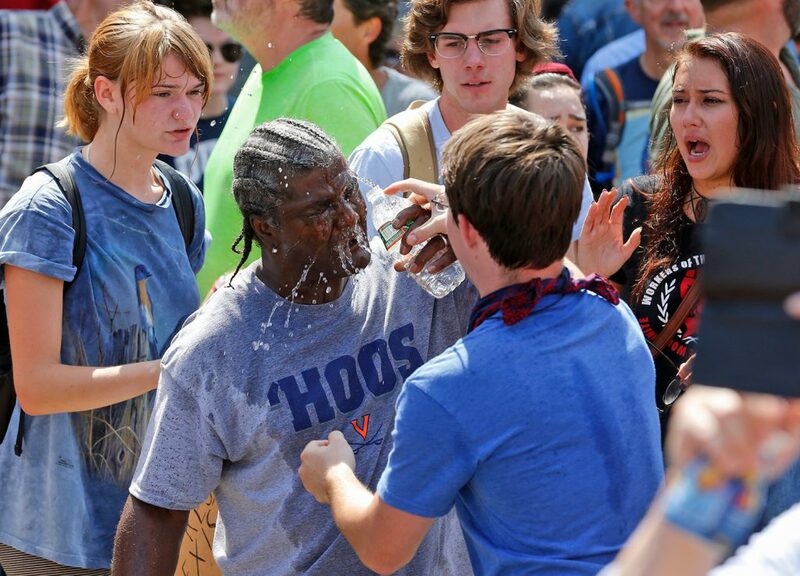 White nationalist demonstrators walk through town after their rally was declared illegal near Lee Park in Charlottesville, Va.
A counter demonstrator is splashed with water after he was hit by pepper spray from an white nationalist demonstrator. 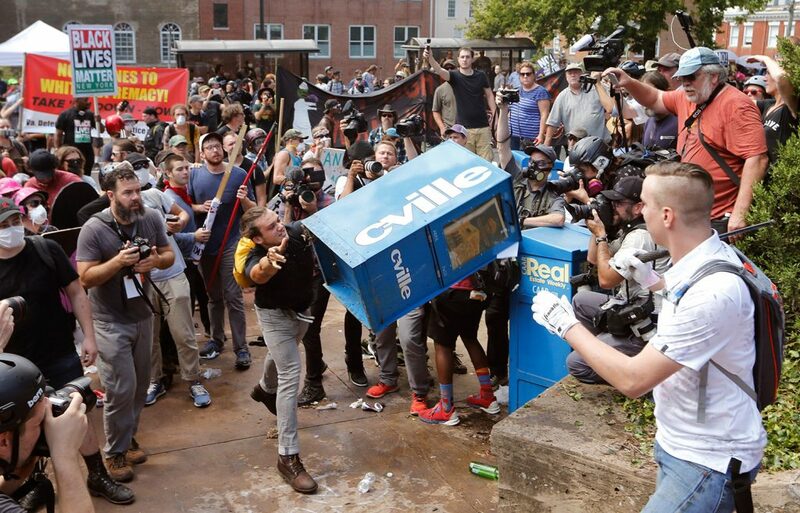 White nationalist demonstrators clash with a counter demonstrator as he throws a newspaper box at the entrance to Lee Park.